It seems that more and more, visiting the popular LiveAquaria Diver’s Den is like window shopping for Ferraris. On second thought, I guess we should say Porsches since that seems to be Kevin Kohen’s (director of LiveAquaria) choice of vehicle. Regardless, the Wisconsin-based online retailer just keeps getting those ultra rare fish, corals, and invertebrates that open up worlds of opportunity for aquarium keepers looking for something you just don’t see every day. The last gem to cross our computer screens is a crazy looking and very rare black and gold Tridacna maxima clam collected out of Tahiti. This 5″ long stunner has a price tag hovering around $700, which puts it in the upper echelons of clam-dom and makes it an instant collector’s piece for those who want are looking for stunning centerpiece in their clam garden in the bottom of their aquarium. 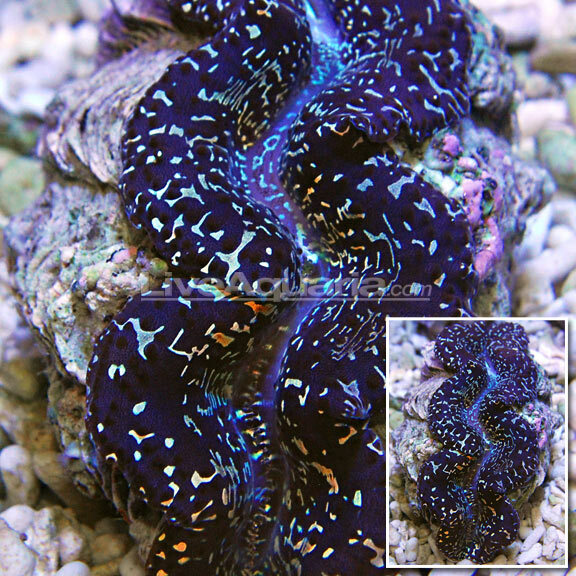 For clam lovers, Tahiti has been an absolute gold mine for some of the best looking T. maxima clams the hobby has ever seen. The colors and patterns on these clams are out of this world, with most of the individuals sporting a vibrant blue that is unrivaled in virtually all other clams. The big downside to these clams is obviously the price. For years, the standard maxima clams went for $50-60 depending on their color and size. These Tahitian individuals, however, seem to have a minimum price of $200 and they obviously climb much higher. Sure, the regular old maxima clams can still be had, but with these Tahitian clams in circulation, who wants the same old boring stuff? Heck, this clam is only matched in color and rarity by the always rare Blue Squamosa clam (T. squamosa), which has fortunately seen a relatively large number entering the trade as of late.